Air Canada is offering a 20% off sale today. 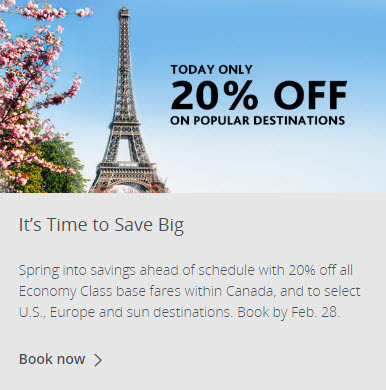 Today only, save 20% on all Economy Class base fares on flights within Canada, and to select U.S., Europe and sun destinations when you use Promotion Code SPRINGSALE20. Don’t miss out! Book by February 28, 2019. Book by February 28, 2019 at 11:59 pm from your city of departure in Canada. Valid on Economy Class (Basic, Standard, Flex, Comfort and Latitude) base fares. Travel valid from February 28, 2019 – October 31, 2019.